This will be your Favorite American Patriotic Bow! This starts with a white 2.25" base grosgrain bow. It is layered with all kinds of American Pie goodies in a pinwheel fashion. There are strips of 1.5" red, white, and blue ribbon mixed with a 1.5" red with white moon stitch ribbon. Then three stripes of 7/8" ribbon in blue and stars and stripes forever ribbon run through the center. Four loops of a 3/8" white with red moon stitch ribbon cover each loop of the bow and also wraps the center of this fantastic bow. 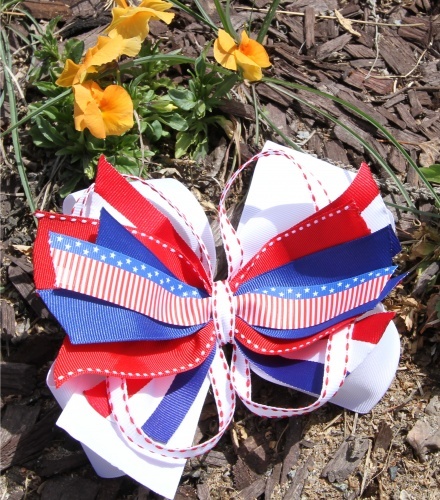 This Stars and Stripes American Patriotic Bow is great for all of our American Holiday Celebrations! There is room on the front tail to add your personalized first initial too.